Most likely at this point in time you’ve already figured it out yourself. I'm not exactly a kamikaze-foodblogger, ready to do anything to keep fueling the Holy Fire of culinary creativity. Sometimes I need to take a break, and it usually happens when at night I start dreaming of crying tomatoes, who beg me to find them one mozzarella that deserves its name; of lumpy dough growing out of proportion, accusing me of never feeding it with a sourdough starter; of out-of-reach croissants, that first shake their buttery fragrance under my nose, and then run, run far away, and happily jump into a bowl of coffee. Unmistakable signs that it's time to take a vacation, amuse oneself in the sweetest culinary oblivion, forget how to make pastry dough, how to gut those poor sea breams, or why months ago I had bought a bag full of barley flour. And this time it hit me so hard, that for few weeks I seriously considered giving up and blog-retiring after only one year of (respectable) service. And because I trust you and I know you won't tell anybody, I admit that during the past months I've done crazy things, like selling 22 cookbooks (!!) one after the other, the Kitchen Aid, a clay pot that I had never used, and my beloved Imperia. And, even worse, I didn't even regret it. It was so easy. ZAC! The time to write an online ad, and that's it. Just try it. And yet, as unexpectedly as it went away, the culinary fervor shows up again, taking over your commuter's fantasies and forcing you to reach for the few books that have survived the massacre. It may have been October's crisp air, that one random day ordered me to lock myself in the kitchen, baking cookies like crazy with the oven in full glory; or it may have been all those pumpkins, slaughtered for Halloween, that begged me to please use them for a risotto. The thing is, one day I simply went and bought a cute new apron, I took out the tools from the bottom of the drawer (what am I talking about? I don't even have a drawer...), and I recharged my camera's battery. Enough doughs went under the blades, enough chickens went under the broiler to make me understand that it'll be always like that, an on-going change of feelings, an endless love/hate relationship with this insanity called blog. Foodblog, to be precise. That sweet vacation was not the first one, and for sure it won't be the last one either. Take me as I am. Why the Holy Fire hypnotized me with visions of chickens, citrus, and marmalade, I don't know. As for me, I didn't put up any resistance, quite the opposite, I took it as a good excuse to use one of the countless marmalade jars in my pantry, freeing up space for the next one. Pat the chicken dry with paper towel and rub it with salt and pepper. In a small pan mix orange marmalade, juice and grated zest of lemon, bourbon, and ground clove, and warm them up. Pour marinade over the chicken pieces, so that they are covered on all sides, and let rest for at least one hour. 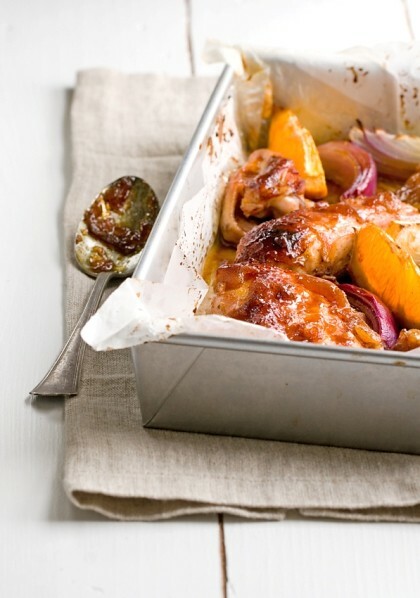 Then, place the chicken on a baking pan lined with parchment paper, skin side up, add the onion and one orange, quartered. Drizzle with the juice of the other orange, and bake at 400 for about one hour, or until chicken skin is golden brown. Place chicken on a serving dish. Collect the juices from the bottom of the baking pan, place them in a small pot and reduce them to a thick sauce. Pour it over the chicken and serve. It may be unnecessary to say this, but I strongly recommend eating the above dish with your hands. Lick it, people, lick it. الخروج والمسارات الخارجية خالية من الأخطار المحتملة. حسنًا ، قد تبدو هذه المهمة أسهل مما هي عليه بالفعل.